The Double Paddle Mag Carrier features two retention screws to keep the mags snug in the holster. The included paddle has three adjustment positions; a straight draw, forward cant, and a reverse cant for your convenience. This holster is an excellent choice for range use or day to day use. The easy on/off paddle is very secure and comfortable. You can also choose a sewn belt loop as your double magazine carrier attachment onto your belt. This means that there will be 2 sewn belt slots on the back of the magazine pouch. 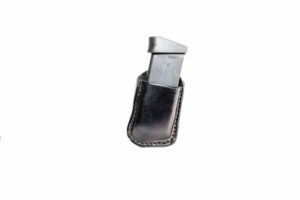 Our mag carriers are made specifically for those who carry extra mags, but do not want the hassle of removing their belt for access to their holster when entering a prohibited area.